This spring break could not have come at a better time. Kids, parents, teachers….everyone was at their wits end with the freezing temperatures and never ending snow. And although we have only had a few marginally warm days since the official start of spring, my taste buds are already craving something less wintery. Enter artichokes. Artichokes are high in potassium, phytonutrients and antioxidants. Potassium has been shown to help maintain healthy blood pressure and phytonutrients reduce levels of LDL, making artichokes amazingly heart healthy! And it doesn’t hurt that they are number 7 on the USDA’s list of the top 20 antioxidant-rich foods. A bonus? Artichoke hearts that are jarred, canned or frozen contain nearly as many vitamins and minerals as the fresh variety. And think of all the money and time saved. Luckily, my spring break and my younger sister’s lined up this year so I planned to spend a few days with her in Milwaukee. 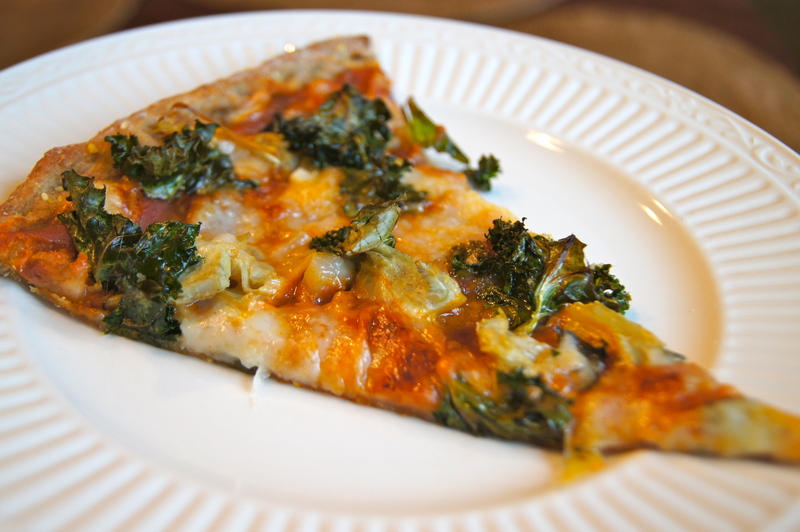 We cuddled my niece, went grocery shopping and cooked this not-so-traditional Artichoke and Kale Pizza. Before we dive into the recipe, let me pause here and say that cooking with toddlers, or even cooking around toddlers, is really hard. To all moms, dads and caregivers out there…I don’t know how you do it! The craziness and mess shocked me. And the really funny part? We had a three to one ratio. Yup, three adults and one kid. Did I mention two of us are preschool teachers? And it was still chaotic. This pizza turned out amazing. 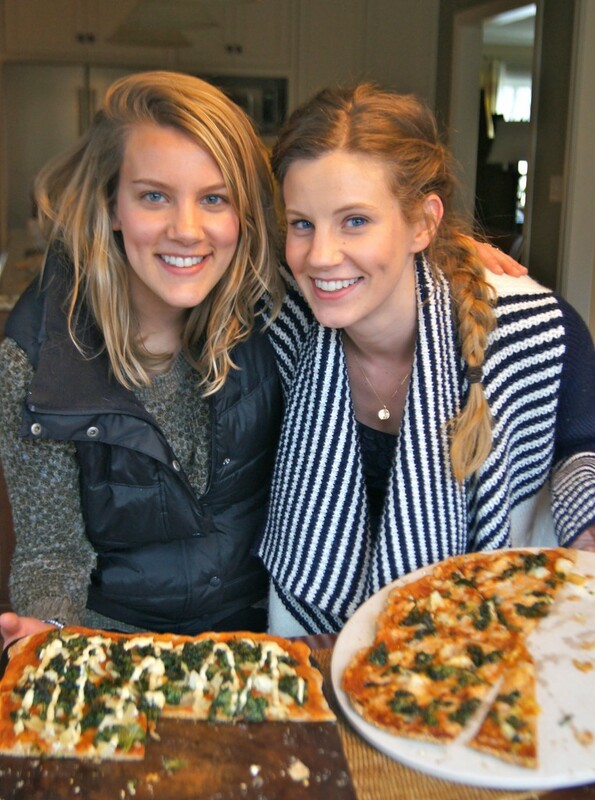 The whole grains give the crust texture and nuttiness that we loved. 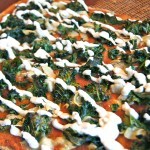 We rolled ours very thin and cooked them on pizza stones, making the bottom of the pizza crispy. Since both my mom and I are lactose-intolerant, we used a goat milk cheddar cheese on our pizza (we find that goat milk is much easier for us to digest). 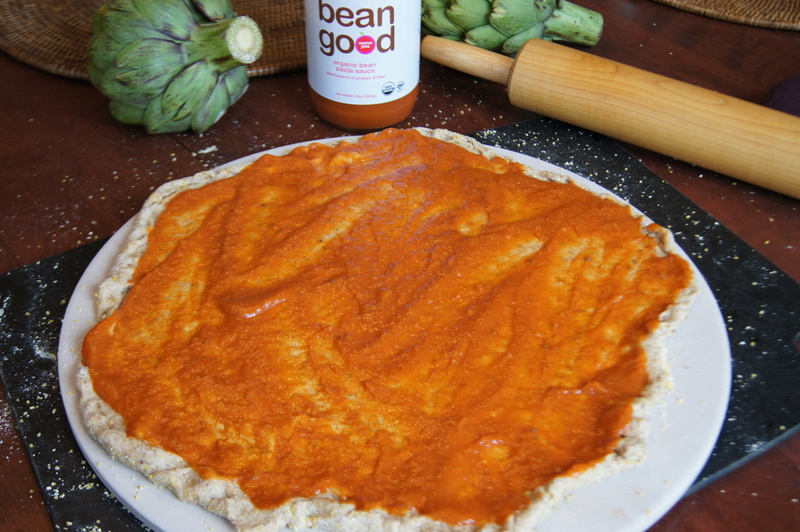 The cheese was gooey and tangy and went perfectly with the Bean Good sauce. 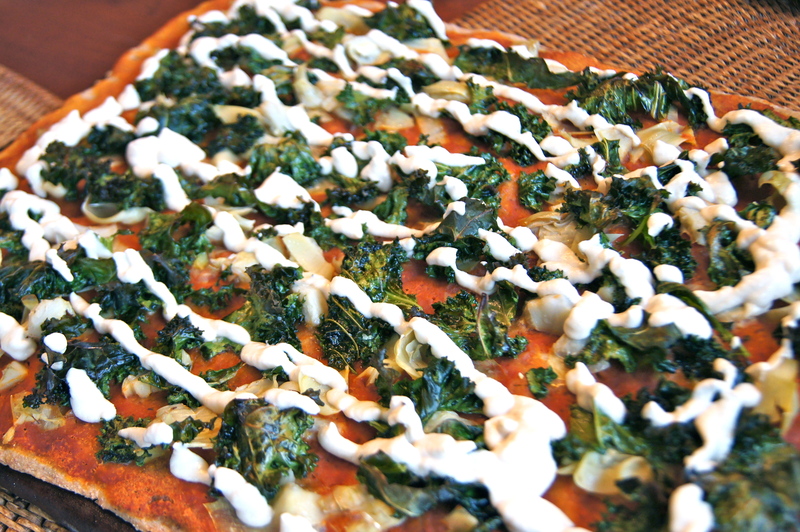 And for a fun surprise on top, we added kale leaves that had been tossed in olive oil. 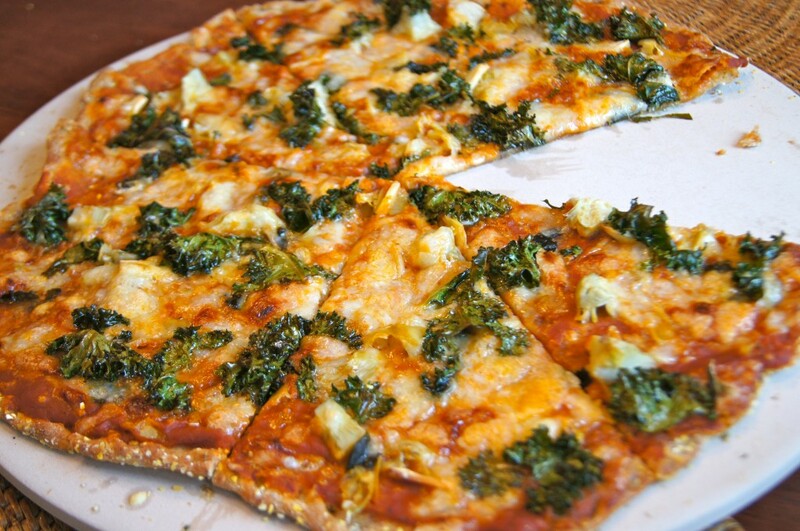 They crisped up the in oven, essentially making crunchy kale chips on top of our pizzas. My sister’s pizza skipped the cheese (she’s a vegan) and used a cashew cream sauce instead. 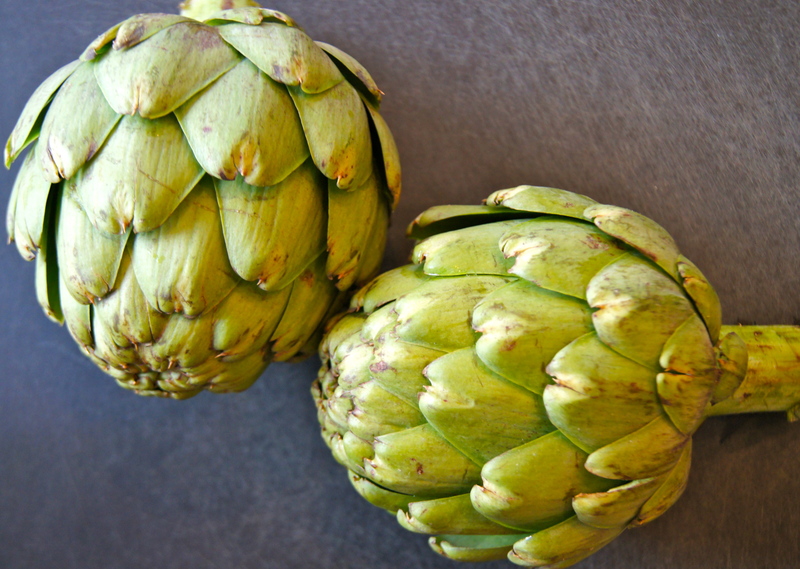 Both varieties were delicious and a family-friendly way for us to incorporate more artichokes into our diets. 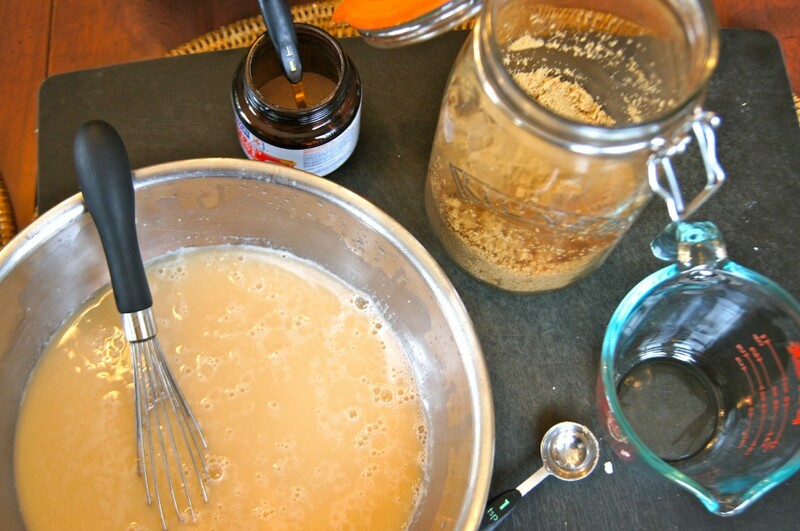 in a large mixing bowl, combine the water, brown sugar and yeast and whisk well. let sit for about 5 minutes, or until small bubbles appear on the surface. add the salt, flours and flaxseed and stir to combine. add the olive oil and mix thoroughly with a wooden spoon, or by hand. the dough will appear sticky. form the dough into a ball and place on a floured surface. 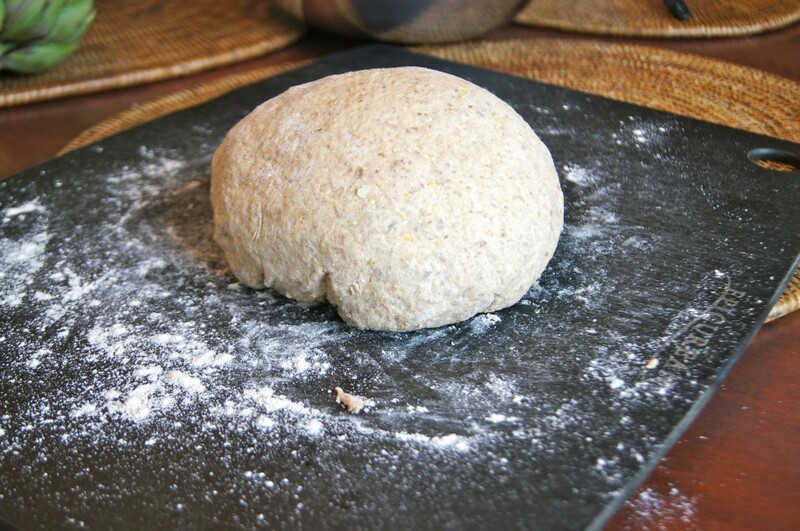 knead the dough until all the flours are evenly incorporated and the surface of the dough is smooth. rub 1 T of olive oil over the top of the dough and cover with a towel. let the dough rest for about 20 minutes. sprinkle the pizza stone with corn meal. roll out the dough to your desired thickness. top with sauce, toppings and bake on a pizza stone at 400 degrees F for about 15 minutes, or until crust is evenly browned. spread the sauce on the pizza, leaving room for the crust around the edge. 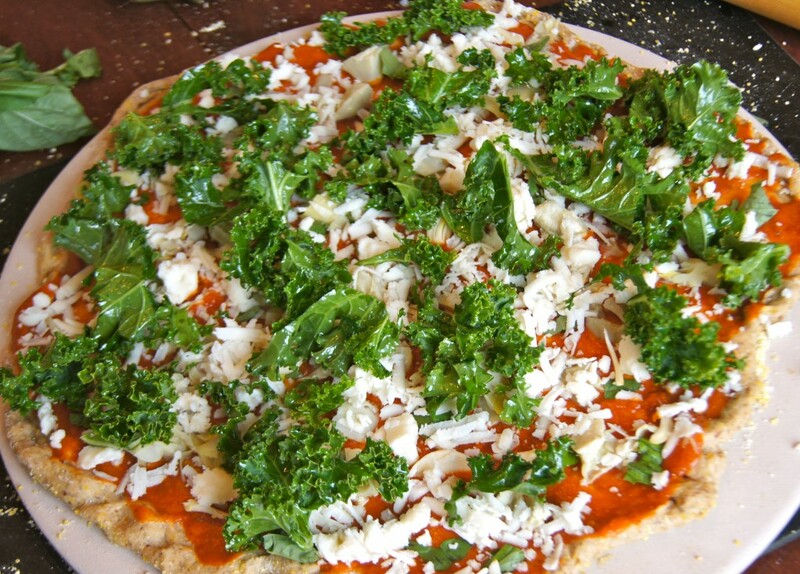 sprinkle with rinsed and chopped artichoke hearts, chopped basil, sliced garlic, grated cheese and kale leaves. bake at 400 degrees F for about 15 minutes on the middle rack of your oven.